If you have a one-story house but feel you still need some extra space, attic conversations may be the perfect solution. 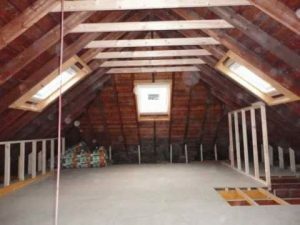 Most attic space is unused, and with a few modifications, this space can be transformed to a comfortable living or lounge space with plenty of personality. Do you have two children sharing a room and wish you could give them their own space? A college student who only comes home during breaks? Would you like a rooftop lounge or music room with a view? Or perhaps an art studio where you can be inspired. Would your husband like a man-cave where he and his friends can enjoy sports or other activities? A family theater room with a big-screen TV? All of these desires can be fulfilled with a great attic conversion. Attic conversions increase your home's usable square footage and also its value. Reliant Construction is equipped to handle all aspects of your attic conversion project. From the realization of an idea, to the finishing touches in your new space, to anything in between, we will work to make your dream a reality. Additionally, we can take on your project at any stage of completion. To get a free quote on your attic conversion project, contact us online or call 281-789-4308 for a free estimate or to ask questions.